Here is the truth: successful online merchants know that e-commerce email marketing is one of the most profitable methods to boost sales. According to Brian Whalley, director of product management at Klaviyo, e-commerce email marketing can help good stores generate between 25 to 40% of their revenue. Therefore, if any stores have revenue of less than 25%, they may underestimate the best tools that would help them thrive. In this article, we’ll find out why e-commerce email marketing can be the ultimate solution to increase conversion. We’ll also cover specific steps you need to take if you want to improve your email marketing strategy. Use them alongside other online marketing techniques to grow your store faster. If you want to run an e-commerce email marketing, first, you need to have a strong email list. In other words, you need to have as many customers who subscribe to your email as possible. The larger your list, the more power you have. The signup process is messy. If your customers have to go through three screens and fill in a lot of personal information just to sign up to your email list, they’ll skip the process (and possibly leave your store) immediately. To get their emails, your signup process should be straightforward and have something to encourage customers to enter an email. You don’t have a lead magnet or your lead magnet isn’t strong enough to convince customers. Think of a lead magnet as a source of motivation for your customers, as an offer. If they know they’ll get something valuable after entering their email into the Subscribe box, they may take action without any hesitation. To ask for a thing, you should give out another thing. In terms of getting customer emails, “another thing” is specially called a lead magnet which aims at attracting leads. Often times, brands use a discount, a voucher, or a promo code as a lead magnet. For example, Zalora Singapore incentivizes email opt-ins with a $15 voucher plus the fashion updates and product launches. However, your lead magnet doesn’t have to be an offer. 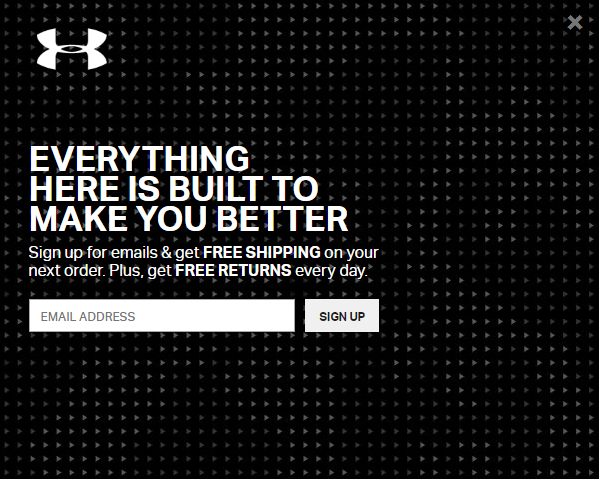 You can give your customers as long as it brings real value to your potential customers, like Under Armour does. They encourage their visitors to sign up an email to get the free shipping on the first order and free returns every day. Have you ever found yourself on a store that immediately threw a pop-up in your face, asking you a lot of personal details? It appears even before you navigate the site. If you’re like many customers, it’s more likely you’ll click away and never come back. And your customers also do the same way if something annoys them. That’s why you should pay much attention to the quality (rather, simplicity) of your opt-in form and the location you place it. There’s only one good form which locates at a good position and drives many emails rather than there are many forms at the locations which don’t bring any good result. Take a look at Perfume.com which has a bar at the top of the site. This bar is always present on every page, with an attractive discount to capture visitors’ attention. Whenever a customer visits the store, they see the bar with the discount. Once they click the bar, an opt-in form will be shown. As you can see, the opt-in form is super easy for visitors to sign up. It’s literally just an email address and a single click. That’s it! You can apply other strategic places where you can position your opt-in forms above the fold or at the bottom of the product page. 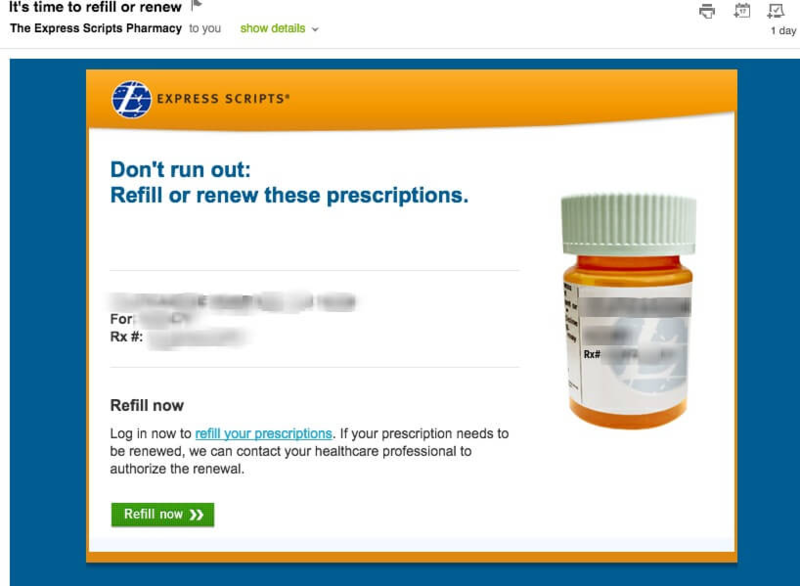 A worthy note that a simple opt-in form isn’t always a good strategy. It depends much on what you want to achieve. The why will comes in the next section of this article. Personalizing your emails or email personalization means making your emails more personal. So, your customers are more likely to open the emails and click links inside. This technique actually works. The thing is a few marketers don’t know how to collect the right data for personalization and how to use it. Below are the solutions. If you’re not getting the right kinds of information, you may not have a good starting point when it comes to email personalization. A good strategy is starting by collecting information from your customers on opt-in forms. 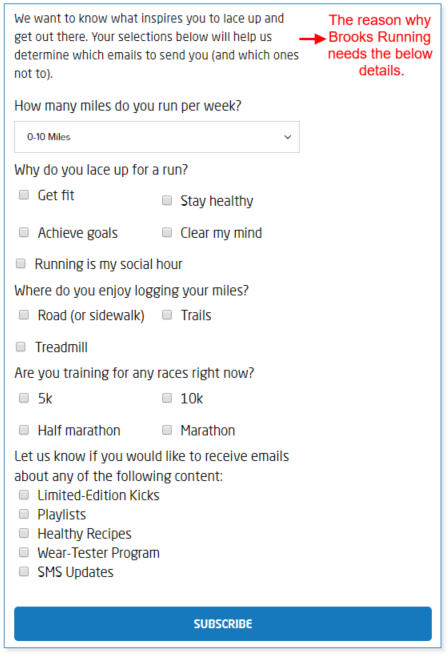 It’s something like this: when you create an opt-in form, add some additional questions beyond the typical email address and name. This way, you can classify your customers into different segments and understand what they really need when visiting your store. But does that make your form look messy and annoying? The answer is NO! You can ask for customers’ gender, birthday, or occupation. At the same time, give a clear reason why you need those piece of information. Take Brooks Running as a typical example. After a customer enters their email, they will be directed to this form. Here, Brooks Running hits the nail on the head by asking for a few pieces of information without annoying customers and pushing them to exit the form before signing up. They cite a convincing reason why the customer should answer all questions. Also, all questions are multiple choice, so it’s easy to give the answers and finish the form. The golden rule is still not adding too many questions. Keep your opt-in form short but sweet. 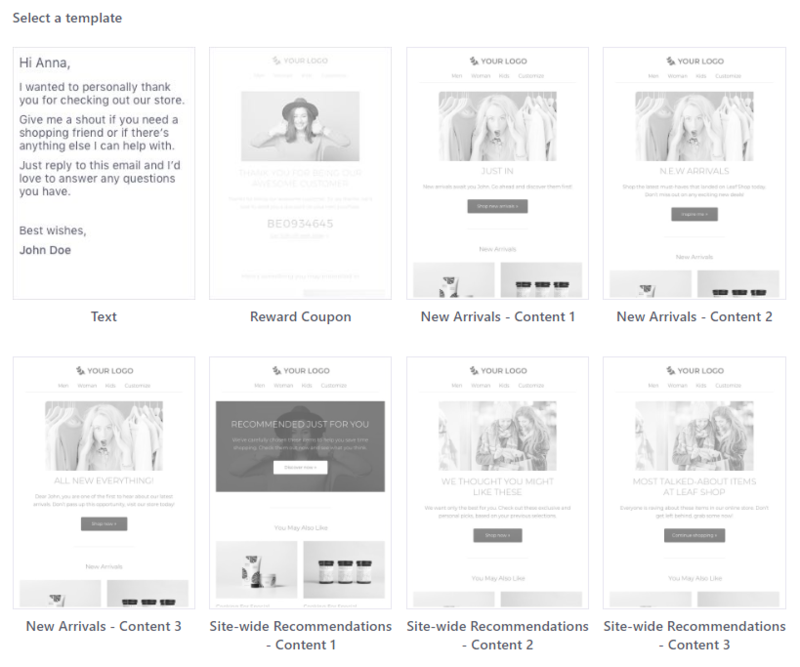 Behavior recommendations are a customer-focused e-commerce email marketing strategy to offer immediate values for customers based on their actions. You can use the information about your customers, for example, the number of times they visit your site, their purchase history, or the categories/products they’ve visited most often, to target appropriate emails to them. One of the most popular email practices using behavior recommendations is sending emails to recommend similar items or accessories based on a customer’s previous ones. Or, if your customer bought items that require replacement, refilling, or renewal, you can then send them targeted emails based on their potential needs. For example, if a customer purchased a prescription, you can guess about when it might run out. After that, some weeks (or some days) before the time you predicted, you can send the customer an email to suggest them to refill. Customers will appreciate the recommendations if they’ve liked their previous orders that were similar. Rather than trying to extend your customer list with a promotion, it’s better to send it to those who have shown interest in a relevant topic. You can apply this tactic to any industry as long as you keep your products relevant to your customers. And, give them a discount or a gift if you want to make your email a higher level of personalization. 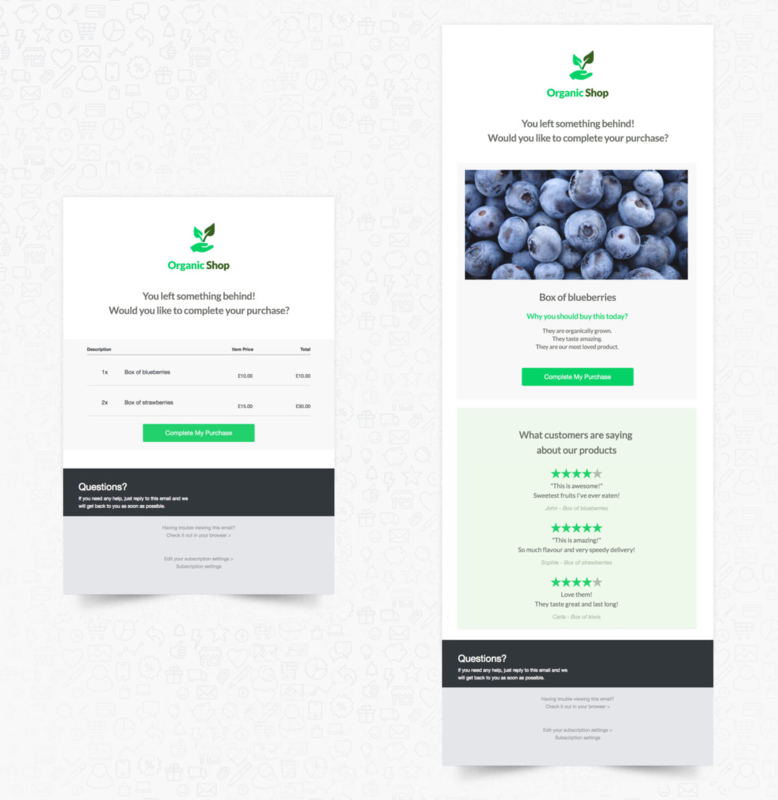 Be sure your landing page is also well-designed and related, so you direct your customers to the right place. An important thing that you should do to start your e-commerce email marketing is to segment your customers. You can break up your list by geographical location, industry, language, job title, or previous engagement with your store. In reality, you’re free to segment your email list any way you want. Just make sure to be as solely as possible when sending emails to each subgroup. We’ll walk you through how to do it on Mailbot since the platform is powerful, and many online retailers have been using it. 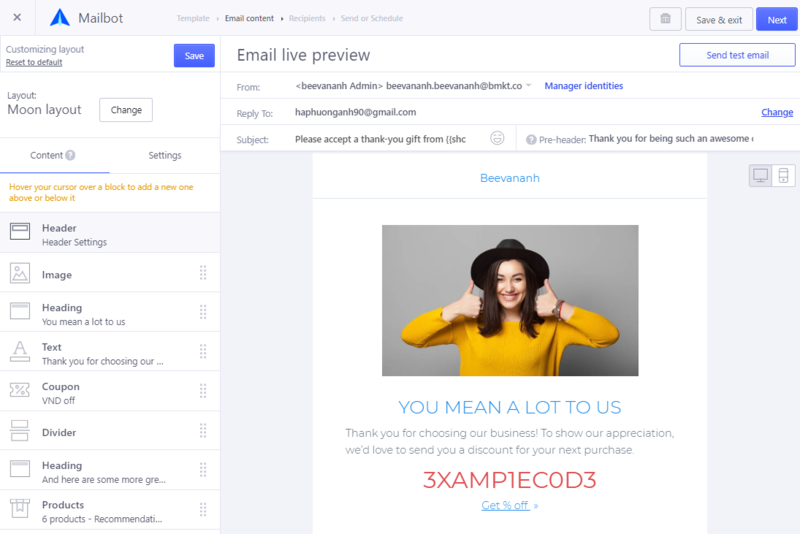 This is a useful e-commerce email marketing automation tool to group your customers into different segments and help your customers keep unwanted emails out of their inbox. Just name your segment and set your desired conditions. It’s as simple as that! 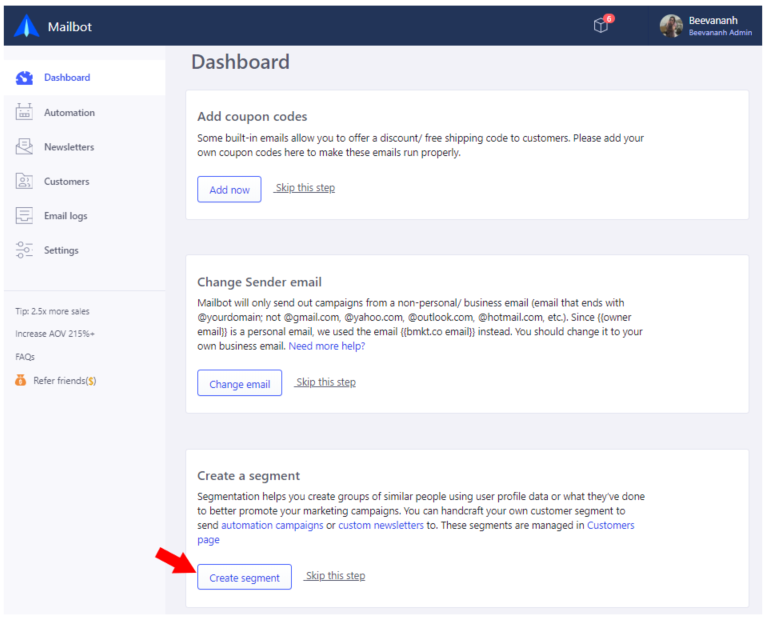 The first time you use Mailbot, go to the dashboard and click Create segment in the Create a segment section. Then, you see the Segment window which allows you to add a segment name and set conditions. Regarding the name, give your list a descriptive name so that you can find it easily later. For example, if you want to tag all of your customers who already view the product Wolfsblut – Blue Mountain, then name the field “Blue Mountain”. The explanation is simple: My “Blue Mountain” segment includes customers who view the Blue Mountain product at least three times ever. Once you’re all set, click Save. 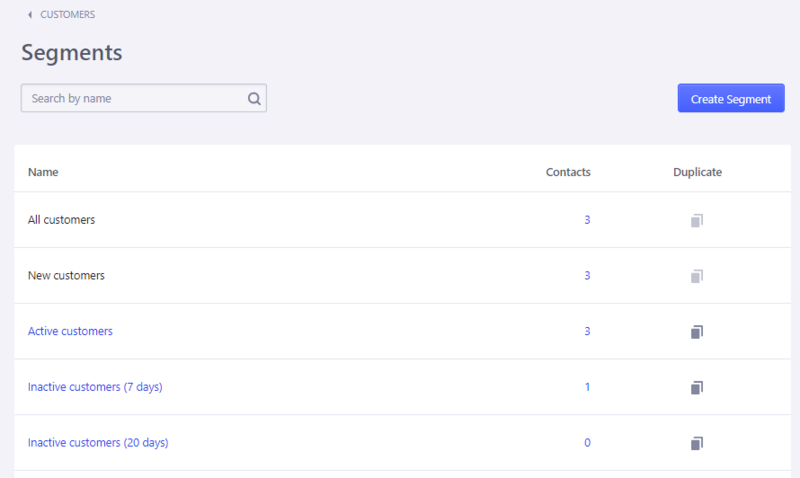 Apart from creating new segments, Mailbot also offers you premade segments. 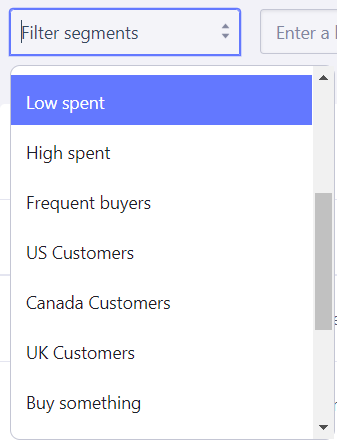 There are a variety of segments available based on customers’ buying behaviors such as frequent buyers, customers with high average order value, and top lifetime spenders. To manage all segments (both manually created and premade), click Customers on the left menu, and then click Manage segments. On the Segments page, you can view, duplicate, or delete segments in a matter of clicks. When everything pleases you, you can start sending emails to certain segments. Click Save. From now on, whenever a new customer makes the first purchase, this email will be automatically sent to them. After your customers complete their purchase and make payment, don’t ignore them. Instead, keep connecting with them to let them know you appreciate their trust and show them you still care about their satisfaction. Using post-purchase follow up is a good way to ensure you stay relevant, improve your customers’ review, and boost your sales. Cross-selling and up-selling aren’t secret techniques. You may have heard them all the time. In an e-commerce email marketing, you can apply these methods to develop repeat customers. This is a powerful way to improve sales and build patterns of repeat purchases. To cross-sell and up-sell with emails successfully, you need to focus on two key factors. The first is relevance. Cross-selling: Once a customer made a purchase, send an email to them with suggestions for other products. Up-selling: Once a customer made a purchase, send an email to them with more expensive items. These items can be an upgrade to the next version of a product or adding features like warranties. The more relevant the recommended products to your customers, the more likely they will make purchases again. The second is timing. An offer should be delivered at the right time in the right place. Often times, you can compile and trigger an email immediately right after a purchase is completed. The goal is to thank the customers and offer them for up-sell and cross-sell items. Alternatively, send the email after a specific period of them from the transaction. This ensures your customer has received the products in their previous order. Best time to send: 2 days after your customer receives the product. This email should make sure the shipping went well and the product arrived as expected. Depending on the product, you can ask your customer for a review as well. Best time to send: 4 days later. 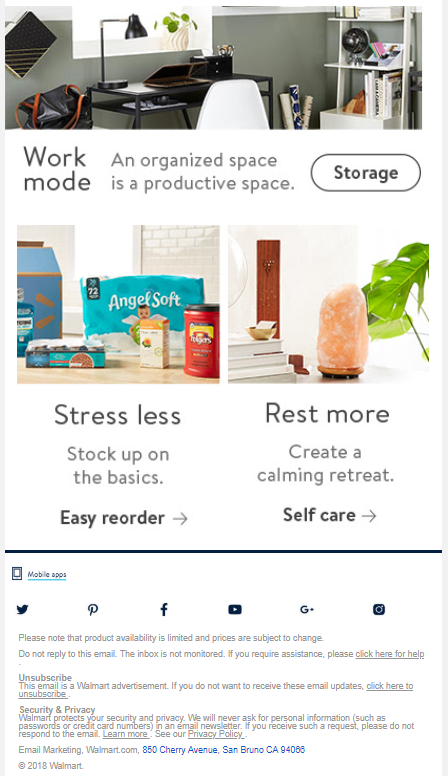 Walmart uses the last items their customers purchased to show them new ways to create an organized space. So, the customers will stay mindful and fresh all the time, even when they’re working. They don’t show any specific products. Instead, they give some suggestions to help their customers easily decide what they should do next. Showcase only a handful of products. Don’t offer too many since it can overwhelm your customers. Feature products that are related to customers’ past purchases, and promote the product bundle as a “set”. Set an appropriate price range. Don’t send your customer a $300 product while they only purchased $20 products from you. Note: There’s no right way to cross-sell and up-sell. The products you sell, customer behaviors, and how you create your sales funnel will all impact which emails you should use. It isn’t uncommon when a customer adds products to his shopping cart and then leave your store. In this situation, an abandoned cart reminder can keep that almost-purchase fresh in his mind. First-time visitors to your site are always careful and take much time to consider before opening their wallets. This is where social proof can help. 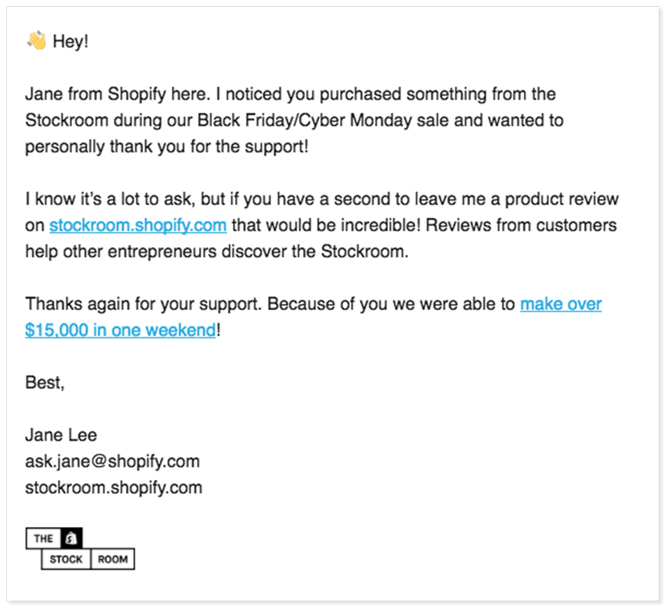 A good strategy is adding product ratings and good reviews about your products (and your brand) to email. So, your potential customers can know others, like themselves, have been satisfied when buying something from you before. Birchbox brings their abandoned cart email to the higher level. They ask their customers what if they didn’t find exactly what they’ve been looking for, then recommend some better items. They also use the star rating and the number of reviews to make the products more compelling. If their prospects need more proof, they can click Read the reviews to find out. A basic abandoned cart email often include multiple products. This leads to a problem that your prospects may not have equal purchasing intent for all those products. Choose a best-selling or best-rated product in the cart since it has a high conversion. Specifically, highlight some of the significant benefits (or unique selling points) of that product. Write the best copy and add some objectivity like reviews. Below is a comparison between a “traditional” abandoned cart email (left) and an “innovative” one (right) which uses the spotlight effect. When it comes to your loyal customers, discounts may not always work well. It’s because they’re familiar with your brand and regularly purchase from you before. In this case, you should switch to level up your loyalty and rewards program instead of sacrificing your profit margin with other discounts. Look at your average order value (AOV). Assume it’s about $100. Review your reward tiers in your loyalty program. Then, using your AOV to specify how many loyalty points a single member needs to get at least a 10% discount. Assume 200 points equals a 10% discount. Create a segment using an e-commerce email marketing tool (like Mailbot) for all members that have more than 200 points. 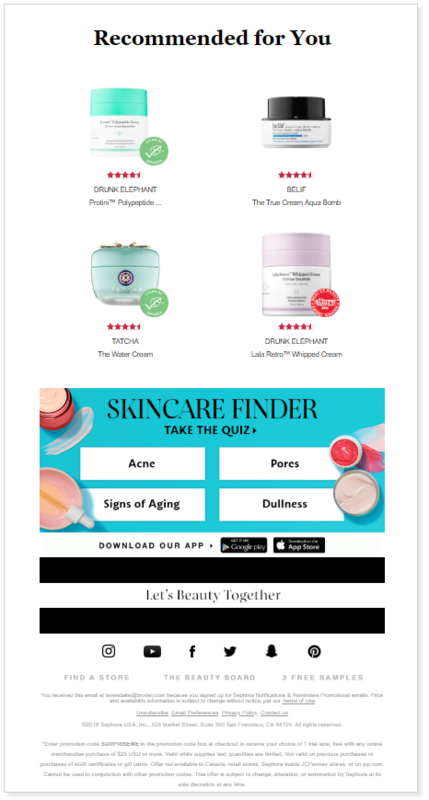 Send this segment a different abandoned cart email campaign. In the email, you don’t need to use a new discount. Instead, emphasize that they (your customers) have loyalty points which they could use to get at least 10% to make a new purchase. This strategy can give your recovery rate a nice boost, especially if every rewards tier unlocks other exclusive rewards. At the same time, you remind your customers of their points balance and the additional points they need to reach a next rewards tier. You don’t have to issue a new discount, too. Look at American Airlines’ frequent flyer program. The more a customer flies, the more reward miles they earn. If they earn a certain amount of miles in a specific amount of time, they can be upgraded to the next level which means more miles and more benefits. E-commerce email marketing isn’t just about you or your company. Rather, it is about your customers. So, just sending a bunch of newsletter emails or a single order confirmation email doesn’t mean you already get the job done. You need to focus on where your customers are in their buying journey, and what they really want from you. Once you keep this cardinal rule in mind, your customers will not only read your emails but also want to hear from you at all times. More importantly, you’ll get the best ROI you want.